When the Queen City was chosen to host the 2012 Democratic National Convention, SOLID created "We Make It Possible", an immersive, shared brand experience to welcome 35,000 delegates, media and VIP's, engage the local community and catalyze a legacy of positive impact in the local and state community long past the end of the Convention. The brand was articulated through a robust campaign that included digital and social media, paid and earned media, on-site brand activation, live events and volunteer engagement opportunities. Key to the effort was creation of a coalition of economic, governmental, arts/culture, non-profit, academic and philanthropic organizations to drive the "We Make It Possible" brand experience out through shared channels and networks, leveraging the campaign to much higher levels of exposure than otherwise would have been possible using host committee resources singularly. Have a story to share with the world? Let's talk! 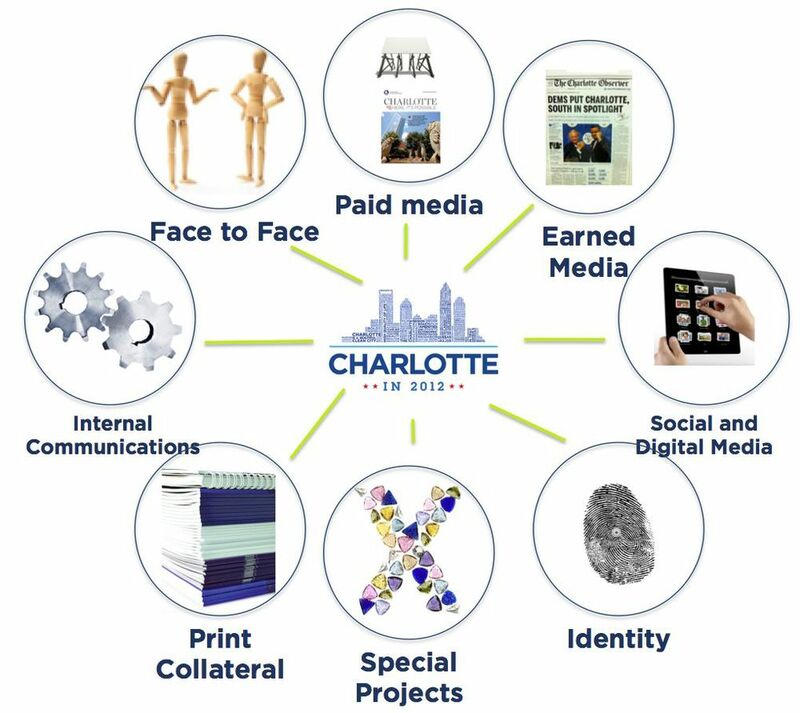 An immersive Charlotte in 2012 brand experience gave multiple audiences comprehensive points of access into the narrative and leveraged brand assets to exposure to millions of people across the nation and around the world. The "We Make It Possible" video (click to play above) was produced by SOLID with partners (special thanks to the Charlotte Chamber of Commerce and GreyHawk Productions) to welcome delegates, media and visitors to the Queen City as a part of the comprehensive Charlotte in 2012 brand experience. The video was shown during the Convention to assembled delegates, featured on the website and social media channels. The making of the video was a catalytic civic engagement experience as economic development institutions, the arts community, students and local city and county government came together to produce a marquee video story. Local youth, dancers, choreographers, production crew and volunteers came together to create the "We Make It Possible" video, providing not only a video worthy of sharing with 35,000 delegates in the Convention arena as an official welcome, but a once-in-a-lifetime experience for the youth and their families. Carolina Stories short videos, featuring over sixty 2-minute videos produced as a key part of the Charlotte in2012 brand experience (click above to check them out!) The videos highlighted key messages to extend the "we make it possible" brand narrative about the Charlotte region to over 35,000 guests on site and many tens of thousands more through digital and social media platforms. The videos were produced via a collaborative effort with local videographers, writers, photographers and leading partner institutions, adding voice to the "We Make It Possible" brand narrative and experience. Visual brand activation across the Charlotte region greeted visitors at key touch points in the brand experience, including brand activation at Charlotte-Douglas International Airport, all official host hotels throughout the region, shopping and entertainment venues, cultural facilities, street and highway signage, welcome packet collateral materials, volunteer costuming and digital signage. The "We Make It Possible" brand marque and multi-channel, immersive experience is unveiled to community and convention leaders by Mayor Anthony Foxx. While official delegates, media and VIP's convened in the Time-Warner Arena (pictured above), the "We Make It Possible" Kids' Convention concepted and produced by Charlotte in 2012, SOLID and partners brought the convention experience alive to hundreds of families eager to participate in the excitement of this historic event and to learn more about American democracy, civic participation and the power of getting involved. Click the image above to find out more about the Kids' Convention. Paid media in USAirways magazine and other outlets over six months prior to the Convention helped to share the Charlotte in 2012 story and build economic development profile of the Charlotte region to hundreds of thousands outside the 35,000 who came to the Queen City for the 2012 DNC. Featured content linked to Charlotte in 2012 digital assets as a part of the overall brand experience. A Legacy of Impact. As Charlotte and the region prepared to host the 2012 Democratic National Convention, the community came together under Mayor Anthony Foxx's leadership and the help of Charlotte in 2012 staff and thousands of volunteers to improve people's lives long after the last balloon dropped. Watch the video above and find out more about the Legacy of Impact. The Charlotte in 2012 Legacy Village extended the We Make It Possible brand experience to the community, visitors and the media through a festival of volunteer opportunities and hands-on activities. The Legacy Village was created through the collaborative efforts of Charlotte in 2012 staff, community volunteers, leading local community organizations and institutions and SOLID expertise to "walk the walk" of DNC2012 Convention positive legacy impacts across the community. Collaboration is a SOLID value. We were fortunate to work with a fantastic team of people, organizations and institutions to bring concepts to life and make the Charlotte in 2012 brand experience possible in a once-in-a-lifetime effort. Credits and thanks to: K2Forma, Wray Ward, Adam Roth for fantastic collaborative brand activation, the Arts & Science Council, Charlotte Regional Visitors Authority, Charlotte Area Transit System, Charlotte Center City Partners, Charlotte Chamber of Commerce, Charlotte Regional Partnership, Charlotte-Douglas International Airport, the City of Charlotte and Mecklenburg County. Shout outs to core team members: leader Dan Murrey, fearless Dockery Clark, multi-talented Liz Barrett, level-headed Suzi Emmerling, steady Josh Field, photo/vid genius Daniel Sircar, digital guru Dusty Trice, Legacy Village guru Jeff Mallare, volunteer diva Courtney Counts, events czarina Mary Tribble. Carolinas Stories teams high-fives: priceless miscellaneous; Scott Lazes and Kevin Beatty; Lashawnda Becoats and Tonya Jameson. Most of all, to the people of Charlotte and the region - YOU made it possible.